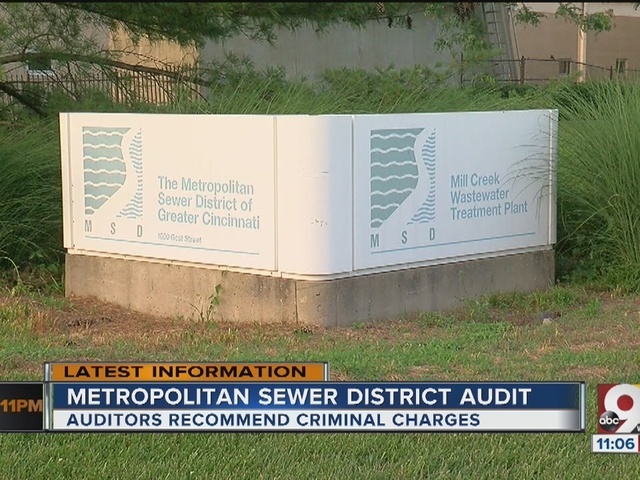 CINCINNATI – City Manager Harry Black offered a sharp assessment about the problem at the center of mismanagement at the Metropolitan Sewer District. "This was an extreme example of contracting-out running amok," Black said after the city released its audit report blasting past MSD operations Tuesday. The 49-page report (read it below) describes a costly, misguided practice of hiring contractors instead of more city employees to do the sewer work and follow the complicated legal steps required by a $3.2 billion, federally-mandated overhaul of the aging sewer system. Black, who inherited the mess from his predecessor, dodged the question of how many millions of dollars might have been squandered in the process. So did the audit report. Sewer bills have more than tripled in the past 15 years, so ratepayers took the blow. "You had a system that was highly inefficient. I can't begin to quantify that without looking at every [instance]," Black said. "I can only assume there were cost savings that were not realized." > "Misuse of ratepayer or city funds for the purchase and delivery of professional services." The audit report puts the blame on former MSD Director Tony Parrott and former City Manager Milton Dohoney. It was Dohoney who gave Parrott contract signing authority – essentially, total oversight and free reign over procurements and the MSD checkbook - in 2007. The audit recommended further investigation that could lead to criminal charges against Parrott. It cited support for accusations that Parrott violated the city residency requirement by living in Butler County and falsified his annual financial disclosure statements. It recommended that "an outside agency determine if there are any grounds for any criminal proceeding." "Those responsible should be held accountable," Mayor John Cranley said at a City Hall news conference with Black and the audit team. Parrott might also face an investigation for his role in a MSD-operated foundation that managed and raised money for an MSD internship program. The audit recommended an Ohio Ethics Commission look into the finding that the foundation solicited MSD contractors for thousands of dollars in contributions. The audit also questioned "the significant investment of ratepayer funds" that helped grow the program's budget from $250,000 per year to nearly $1 million. It also cited nepotism in the internship program, pointing out that seven children/grandchildren of city employees were hired as interns. Parrott, the deputy MSD director and the MSD superintendent were the foundation's only directors. Parrott is now director of the sewer district in Louisville, Kentucky. He was interviewed by the audit team and fully cooperated, Black said. The report says Dohoney’s delegation of contract signing authority to Parrott "significantly weakened oversight of and visibility into operating practices at MSD from 2007 until the current City Manager revoked the delegation in 2015." MSD "regularly deviated" from its procurement policies through the extensive use of existing Master Services Agreements (MSA) and Professional Services Agreements (PSA) "to contract for often unrelated additional services rather than conducting a new bidding process," the report says. Under the federal government order to overhaul the system, MSD adopted "extensive use of consultants and other contractors" to implement its plan to comply with consent decree, the report says. "This approach was chosen over the option to add new employees with the required skills and in the required number ... we found MSD’s use of consultants to be extraordinary." > Approve contractors' invoices and recommend the hiring of other contractors. "We did not find a true cost analysis of contracting out for services versus hiring city employees," the report says. Parrott gave most of the work to "a small group of contractors" who "amended and extended" the contracts, sometimes for work not associated with the original contract, said James Goetz, co-chair of the four-member audit team. "Our report identifies some bad examples of that procurement process," he said. Goetz cited the Lick Run watershed project along Queen City Avenue in South Fairmount. He pointed to contract lawyers instead of sewer builders. MSD had to acquire a lot of property and it contracted with third-party legal counsel, he said. Lawyers negotiated purchase options with homeowners and businesses without telling them MSD was the buyer. They figured they could get them cheaper that way. "Anytime federal funds are used the Uniform Act must be followed," he said. "MSD made the decision to comply only when and practical." That could prevent MSD from acquiring state and federal funds for future projects, he said. The audit report makes 34 recommendations, and Black said the city is well on its way to implementing all of them. "I can honestly say we have control over the problem," Black said. "Anything over $50,000 I look at directly myself as city manager." He said he had "no idea [the MSD problem] would be of this magnitude," when he succeeded Dohoney. "I recruited a procurement officer and he brought it to my attention and we immediately suspended the program." While the city runs MSD, the county owns it by a federal court ruling. City and county officials have been jawing back and forth, blaming each other for MSD problems. County Commissioner Dennis Deters said commissioners were still waiting to get a full audit report from the city. He said Tuesday's report doesn't reflect well on the sewer district. 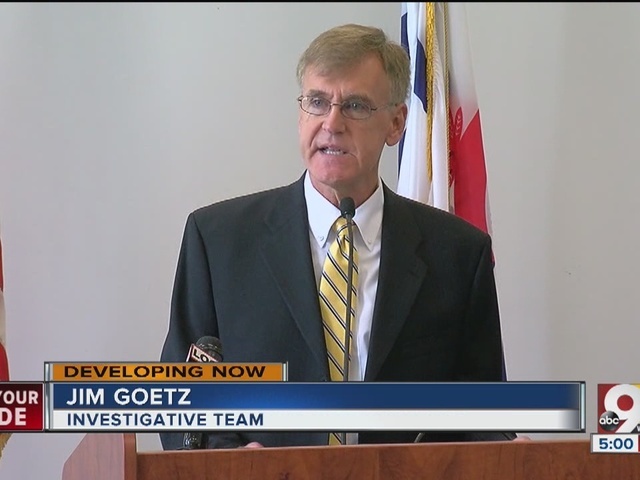 "It's not good," Deters told WCPO reporter Amanda Seitz. "There's a complete lack of accountability in driving these projects with efficiency." Deters said the city also appears to be blaming problems on past leaders. "There's a lot of inclination to place blame on an empty chair," he said. Deters said he is looking forward to hearing the Ohio auditor's independent findings and comparing both audits. Auditor of State David Yost announced a special audit of the agency in February. He said state auditors would examine financial records and other information with an eye for any fraud, theft or misappropriation of funds. Deters said he hopes the state's audit will highlight ways the district can move forward and improve. "My biggest concern is, where are we today?" Deters said. "I'm interested in how we are operating currently. How much has this been improved over the course of the new administration?" State Rep. Denise Driehaus, who is running against Deters in November, called it "outrageous to learn that officials at MSD betrayed the ratepayers’ trust with such poor financial management. The city must continue its efforts to ensure better financial practices at MSD, but those efforts will not be enough without meaningful collaboration with the county.